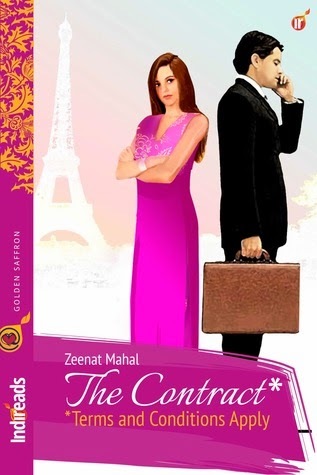 The Contract is yet another bestselling Indireads novella by Pakistani author Zeenat Mahal. Her works- Haveli and The Accidental Fiancée are my favorite. Like always, she has created another impressive story here with just the right ratio and proportion of tradition and contemporary that every South Asian can well connect to. Shahira is a divorced single mother who teaches Urdu to school children to earn a living and cater to her eight year old son, Shahaan’s needs. Though she’s independent and can make ends meet, the patriarchal Pakistani society won’t let her live alone without having second thoughts. The society where only the women under the ‘protection of a man’ are respected, a secure marriage is the only safe haven. But Shahira’s traumatic marriage experience with her abusive ex-husband and ill treating in-laws make her apprehensive every time she considers giving marriage a second chance. In an unexpected turn of events she agrees to a marriage of convenience that’s based on a contract with an upper class busy globe-trotting businessman-Hussain. The terms and condition are that no wifely favors would be expected of her or be forced upon her throughout the deal. After an exchange of vows over the telephone, she’s out of harm’s way. She gets paid like an employee to take care of his daughter Natasha (who completely adores her) and occasionally ailing mother, who sees the perfect daughter in law in Shahira. The arrangement secures Shahaan’s future, allows her to afford luxuries that she could only dream of and to be in the life of the two people who truly loved her- Aunty Salma and Natasha. But things change when Hussain decides not to adhere to the contract. I liked Aunt Salma a lot. Acting like a fairy godmother she’d do all it takes to make the leads fall for each other. She’s a darling. Loved her hilarious strategic planning. Natasha, once shy, overweight, pinning for her father; she lovingly blossomed to a girl with personality and attitude, shedding her extra fat, under Sharira’s motherly tutelage. Hussain was an arrogant trade- maker who had several assumptions about Shahira, but changed to be a better person gravitated by her persona, determined to be the one that protected her. I liked the scene during Europe tour when Shahira realized that Hussain too was broken soul and he too had suffered in his previous marriage, like her. And that episode at home where Hussain wondered why he received only polite curt replies and masked expressions from Shahira, but others in the family received smiles, playful flirting, and glances seeped in love and care. Couldn’t stop laughing!